I thought last year flew by, but it was nothing compared to 2008. this year is breaking speed records, I fear my head is still in august or maybe september and in a couple days it is going to be december! is anyone ready? tempus fugit! here we are in the midst of the thanksgiving weekend and the 'official' start of the holiday season. well, bring it on! that is bring it on if the holiday season turns out to be as delightful as this weekend is turning out to be! 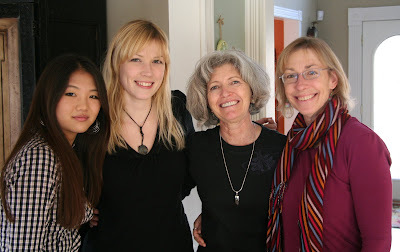 we had a wonderful thanksgiving day. we literally went over the river and through the woods but not to grandmother's house, but to the beautiful home of l&j who live in an eastern suburb of cleveland. both l&j have been trained in the culinary arts in france, the food was delicious. e and I were only asked to cover the dessert portion of the menu.. even though e and I love to cook and create things, bringing food to the home of people who are actually trained by 'the masters' was a bit stressful. but we held our own and received universal thumbs ups for our contributions. we ate on the early side so there was plenty of time after dinner for a bit of a nature hike in a nearby park. 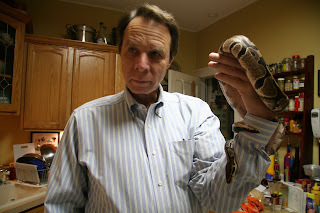 this weekend marks the 10th anniversary of monty the snake as a member of our household. 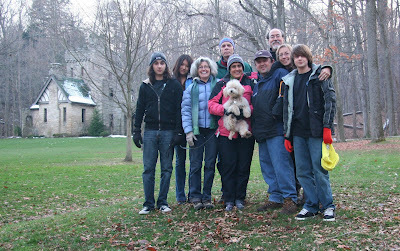 coincidentally, the other family who joined us at l&j's house, spent thanksgiving with us ten years ago and jj was a part of the whole monty rescue story - a story best left for another time. these friends, who I will refer to as d, jj & z, live in the d.c. area. a few years ago they introduced us to l&j and their boys when l&j lived near them. the summer before last, j was transferred to cleveland. it is kind of magical when things like this happen with people! expand the circle and share friends. d, jj & z headed to our home yesterday to wrap up the rest of their time in cleveland. we saw them off this morning at the crack of dawn. last night we had a good old fashioned homemade pizza party. we made four varieties - two red and two white. one of the reds was a traditional sausage and mushroom pizza; although the mushrooms were a tad more exotic than boring button mushrooms - oyster, shiitake, and baby portabellos have such better flavor! 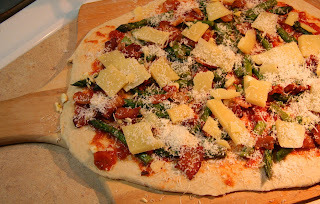 I think the winner of last night's combos was the other red pizza which featured roasted asparagus, bacon, and two varieties of cheese - aged mahon and parmigiano-reggiano. however, the butternut squash pizza was also receiving quite a bit of ooohs and ahhs; but since there is not a slice of sausage and mushroom left maybe it was a three-way tie. the fourth pizza was a feta anchovy concoction - I had hoped to make some anchovy converts. but alas, that didn't happen. the anchovy lovers loved it, the anchovy avoiders avoided it! d saw that making homemade pizza with the aid of a breadmaker is a snap. since she has a much underutilized breadmaker she asked for my dough recipe. d - here you go! place ingredients in order listed in bread bowl fitted with the kneading paddle. select dough large setting - start and voilà in less than 2 hours pizza dough! hopefully the recipe will work with all breadmakers. photos: from top to bottom - deer (this week's saturday safari) in l&j's yard; z,e,d and me; d placing the final item on the table before everyone sits; the gang (minus e - but plus 'indy' who was almost the feature for saturday safari - indy's portrait will come another day, I promise) at squire castle for an après dinner hike; jj wishing monty a happy 10th anniversary/birthday - monty was a baby snake when we found him and since we don't know exactly when he was hatched we consider the thanksgiving weekend his birthday; roasted asparagus pizza before baking. Thanks for the link to Alcott - learned quite a few things about the author of Little Women - potboilers, and all! ahem: dear petite souris, dare I ask what you feed the snake? I can't believe it's almost December either! Those pizzas sound absolutely delicious. I will have to make an attempt someday soon. This post made me hungry and hungry is the last thing I need to be. Isn't Merle a Hoot? But he's right. I haven't felt a hunger pang in days... not thirsty at all, either! 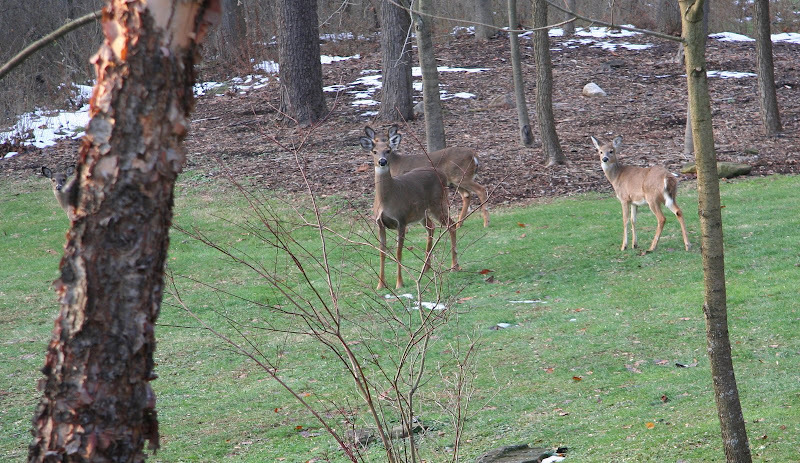 Our houseguests headed home at the crack of dawn this morning. Now the Christmas Preparations begin ... on Monday. rlb - yes a lovely time was had by all! ah, ahem.... monty eats what snakes eat,and he likes them live. needless to say, I do not participate in the feeding ritual and routine. f is in charge of that and he goes so far as to breed the menu.... I call him the mouse wrangler. megan - as I said pizza making is a snap! and it's a great outlet for coming up creative and interesting concoctions - I don't recall striking out on anything (yet) ciao! merle - the downside of all the eating at t-day is it makes our stomachs expand. squirrel - ;) I don't think I told you I love the new seasonal avatar! maybe this year I'll try to send cards and make cookies for christmas...I used to be so good about such things. have fun preparing....holiday hugs to all the boys at your house! Fine bunch a friends and food there. Sad to say, most of those very good vegetables I'd be picking off. I'm hungry for pizza! Sounds like a great way to spend Thanksgiving and the weekend after. Are those coffee mugs that served as the centerpiece for your table? Very clever indeed. Everything and everyone looks perfect! What a great pizza. That is a treat here, too. December is tomorrow. Yikes! Sounds like you had a lovely weekend. I am happy for you! 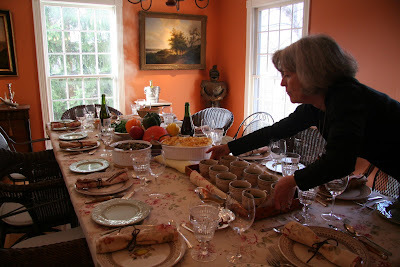 We celebrated Thanksgiving at my house here today with American, Italian and Russian friends and food! I've noticed how quickly time slips by lately; by the time I've got my head wrapped around the idea, the holiday is here! Glad to hear your holiday was full of friends and family!